Since “Canadian cuisine” is heavily influenced by immigrant cultures and varies widely from region to region, I thought I would have to resort to Lonely Planet or TripAdvisor to find the “best” places to eat in Vancouver during my three-week Canada adventure. Luckily for me, I ended up exploring Vancouver’s food scene with the help of locals. James’s cousin, Luke, has lived in Vancouver with his family for over a decade and so they showed us what it was like to live here – while also taking us to all the best restaurants in Vancouver! Read on for the food spots and coffee shops in Vancouver that I visited, and loved. Starting out as a single humble stand at Burrard Street in 2005, JAPADOG is the Vancouver hot dog joint to visit for luscious ‘dogs in Jap-fusion flavors. It’s the perfect way to enjoy Japanese food if you aren’t too fond of rice or noodle dishes. I had a tough time deciding what to order because everything sounded good. (Get the Ume Katsuo shaked fries with your hot dog. Trust me.) 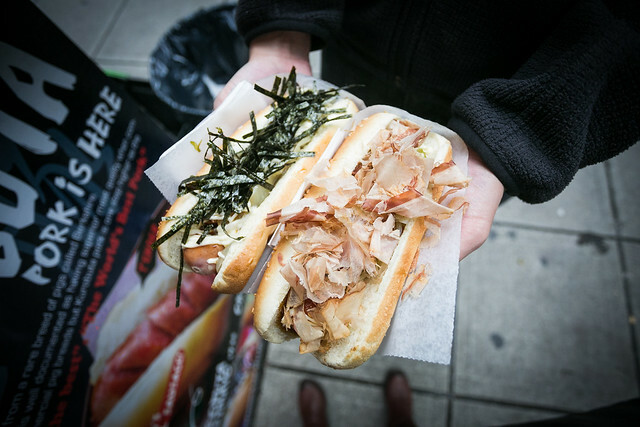 JAPADOG has been so successful that it’s now got seven locations in BC and two more in California, USA – so there’s really no excuse not to try them! This fish-and-chip shack near Granville Island (that’s it up there in the header image) has got a reputation far bigger than its size (and price). It’s one of the must-eat places in Vancouver that I’d heard of long before I even decided to visit. Everything here is reasonably priced (starting from CAD 8 for cod+chips) and seriously scrumptious – my fish came fresh out the deep fryer and the chips have that crunchy, fluffy flavor that kept me munching on to the very last morsel. Anyway, I don’t know why the food’s served in Chinese steamer baskets, you’ll have to ask the crazy crew. If you’ve visited Canada and never tried poutine, did you really visit Canada? Poutine is this hot mess of fries, gravy, and cheese curds that originated from the French province of Quebec but has since spread across the country and is hailed as Canada’s national fast food staple. 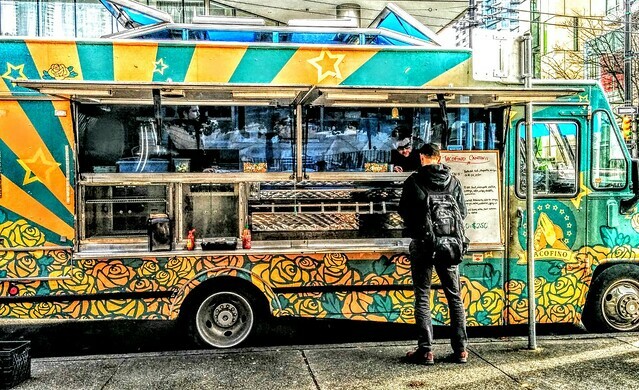 Luke claims that Fritz makes the best poutine in Vancouver, and online reviews agree. Not that I’ve tried that many poutines, but I liked that Fritz’s isn’t too salty – I managed to finish my entire Medium size order, sticky fingers and all. This nondescript shop on Davie street opens from afternoon until late, so plan your visit for supper. For various historical reasons, Canada’s First Nations in the western provinces have been more successful in preserving their heritage. Still, Salmon n’ Bannock is the only First Nations restaurant in downtown Vancouver and you can look forward to wild-caught salmon, game meat, and of course bannock, all in a cozy setting. I was lucky to get to visit Nuba on my very last day in the city. I didn’t know it, but it turns out this Lebanese restaurant in Vancouver is a favorite among locals. Luke insisted we get the Najib’s Special, which looks hardly edible but is in fact the ultimate redemption for a brassica as unloveable as the cauliflower. We had some other dishes as well that aren’t too photogenic but are incredibly flavorful and, frankly, better than the Lebanese food I’ve tried in places like Dubai. Do make reservations, as Nuba gets pretty crowded. This new food spot on Granville Island is opened by the same chef behind Vancouver’s multiple-award-winning Maenam Thai restaurant. As the name suggests, Sen Pad Thai serves variations of Pad Thai from different regions in Thailand. I did wish for more flavor, as well as smaller and cheaper servings, but sitting at a bench outdoors and wolfing down Pad Thai is nicely analogous to the roadside stall experience in Bangkok. Another BC food truck turned local institution, Tacofino (portmanteau of taco and Tofino, where the deliciousness was born) is known for its generously stuffed tacos and burritos, as well as yummy nachos. I have to admit that I find Tacofino slightly pricey if you want a feast (I compare all Mexican food outside of Mexico to my favorite joint, Maria Bonita in Berlin) but it’s certainly worth the farts, oh yes. I’m understandably picky about Chinese food, whether it’s a Michelin-starred restaurant or a zi char (stir-fry) hawker stall downstairs. For a Cantonese food place in Vancouver, Congee Noodle Delight is authentic to what you’d get in a Hong Kong char chan teng diner, but with western serving sizes (i.e. enough for two meals). Fantastic if you’re traveling and really need a comforting taste of proper char siew rice or wanton mee! Although the city isn’t known for coffee excellence, there are a few specialty cafés in Vancouver that I liked. I’m not sure if I got lucky here or was simply caffeine-deprived. Since I was at MEC I decided to come here for my first coffee in Vancouver, and it was a lovely uplifting houseblend that tasted like granola. 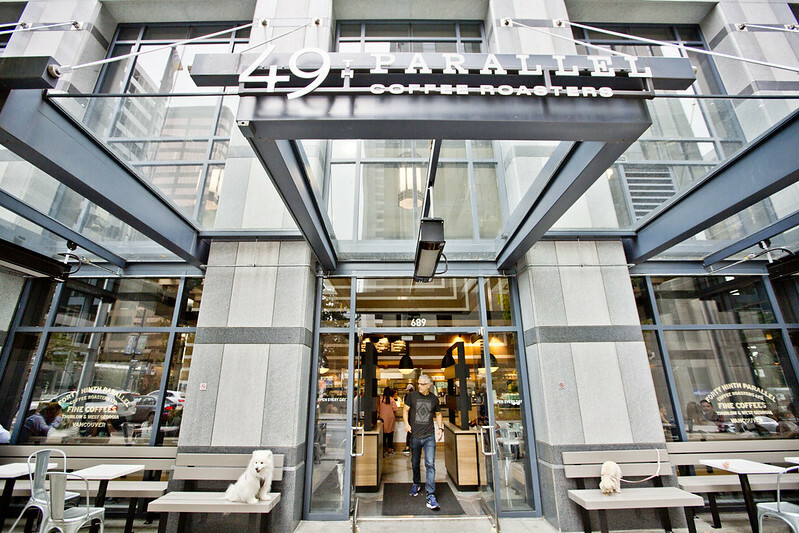 When I brought James to Elysian Coffee’s downtown shop (at Burrard Hotel), however, we couldn’t deal with the over-extracted cappuccino. Stick with the 7th & Ontario branch and hopefully you’ll get a good experience like I did. I didn’t actually visit Matchstick, but both Luke and James did, and apparently it’s worth putting on this list if you need your specialty coffee fix. Besides roasting its own beans, Matchstick bakes its own bread and pastries daily and its outlets have a bright, welcoming feel. I love the alfresco area, which is perfect for whiling away the afternoon. The photo above, however, is of their newly opened downtown location – which offers a brunch menu! Try it and let me know if it’s any good. If you’ve been figuring out where to eat in Vancouver, I hope these local recommendations will please your palate! You can also find more recommendations on my Vancouver map. Ooooo fab tips! I’ve just moved to Vancouver so I’ll be sure to check some (all!) of these out! I actually had Fritz last time I was here because my friend also recommended it as the best place in Vancouver for poutine! That Lebanese place looks great though! And the fish place, and the Japanese hot dogs! Haha. Vancouver is on my list. I’ll be saving this post for when I get there. I like the mix of possibilities from seafood to Cantonese to Lebanese. I would love to try a First Nations restaurant – actually take my boyfriend there, who is deeply interested in their history and art. I didn’t know that such a place existed in a big city, and this is definitely going up my list for when I manage to travel there (I have only been to Eastern Canada and would really love to see the other side). I haven´t been to Canada so far, which is a pity as one of my best friends lives there. Reading your post what I will definitely try is poutine. It looks so yummy. Thanks for sharing. Looks like you have some great places on the list! Never been but will keep it in mind! Yummers! I visited Vancouver last year but didn’t try poutine… I know, the shame. Headed back there next summer so will save these places to check out then. Great tips! I’ve only been to Vancouver once and i was really young and don’t remember much! Will have to go back! All these food pics makes me want to go to Vancouver for a foodie trip. Vancouver is on my list! I’m saving this list, thank you! Tacofiiiiiino! I had one of these bad boys in Tofino and LOVED IT. Your fish and chips look banging too. I’m hungry now! Lol the decent food scene in Vancouver is one of the reasons why I’m seriously thinking of moving there. Hope you get your fill of Tacofino the next time you’re there! THIS is so perfect, I am headed up to Vancouver in a few weeks! thank you, thank you! Bookmarking this for my future! Glad you found this useful! Did you enjoy your trip and the food?